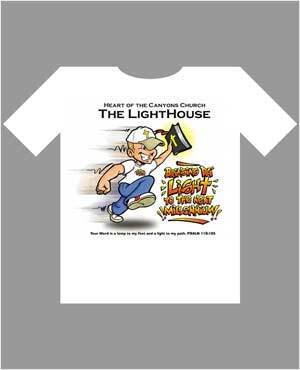 These T-Shirt designs were created for the Lighthouse and REFUGE Youth Groups of Heart of the Canyons Church in Canyon Country, CA. I have been involved with youth ministry for quite a while, specifically being involved with The Lighthouse Youth Group of Heart of the Canyons Church for a couple of years now. As such, I have designed shirts for the youth and staff there. I have been pleased to hear that the youth there have even been stopped on the street at times with inquiries of where these shirts were obtained or how they could be purchased.